Tariq Johnson, African American, 16 years old, is fatally shot by Jack Franklin, white man, on the streets of an unnamed American city. 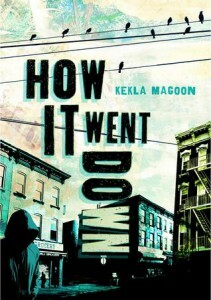 A broad cast of characters each reports the incident differently, in Kekla Magoon’s “How It Went Down” (Holt 2014). Brick, leader of the King gang is surprised but proud that Tariq was carrying a gun. But did Tariq have a gun, or was it a Snickers bar for his disabled sister Tina? Junior, an imprisoned gang member watching the news upstate, says, “some brother got smoked by some whitey who’s gonna walk. So what else is new?” He doesn’t yet realize the brother is his boyhood friend Tariq. Steve Conners says to his college bound stepson, Will, “If you dress like a hood, you will be treated like a hood . . . dress like a man. Simple as that.” Will (AKA eMZee) says, “You gotta have a hoodie to fit in.” As an anonymous graffiti artist, Will “tags” in the neighborhood (wearing a hoodie) while earning top grades in school. A fairly well-meaning churchman running for government office, Reverend Alabaster Sloan, comes from Washington to the neighborhood to bring attention to the needless killing and the injustice of the white man walking. He is center stage for Tariq’s funeral, helping the family. His popularity soars in the polls. He questions his own motives. Cosmetician Kimberly does the Reverend’s make-up for TV shootings. He plies her with cocktails. Kimberly wonders if following the Reverend could be her way out of the slum. Tyrell, once protected by Tariq, also bound for college, may never make it. He knows one false move will land him in the gang and throw him off his life course. What would Tariq have wanted? Does his sister Tina know what Tariq planned? Was he joining the gang? There is so much to discuss in this book of racial strife. There is so much to learn about gang society in this Coretta Scott King Fiction Honor book.